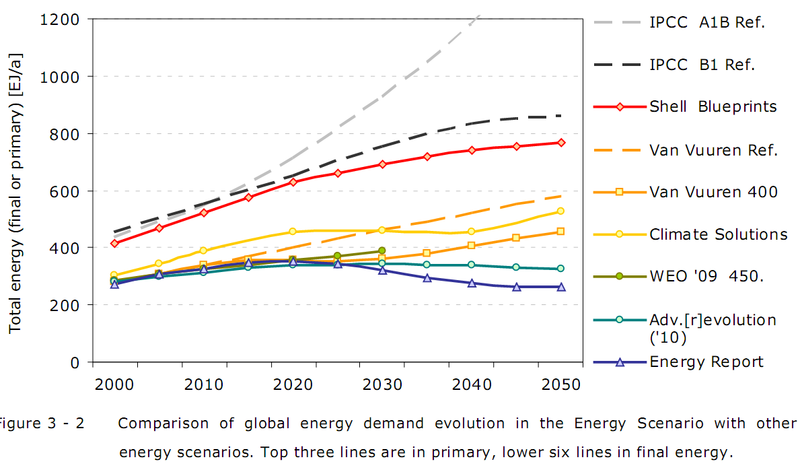 Sustainable Energy for All (SEAL): How much energy will we need? According to David MacKay's book Sustainable Energy - Without the Hot Air, the UK will need 70 kWh/pp/day to cover final energy needs for electricity, transport and heat. This is equivalent to 100 GJ/pp/yr of final energy. In his book Energy at the Crossroads, Vaclav Smil argues that we can get by with 50-70 GJ/pp/yr - 70 GJ was roughly the energy consumption of Japan / France in the seventies. 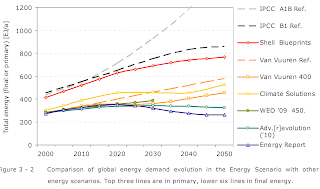 The above graph comes from the recent Energy Report and gives an overview of estimates for primary and final energy needs towards the middle of this century. The good news is that - in a 100% renewable system - the distinction between primary and final energy fades, and that we could suffice with 300-500 Exajoules of annual energy consumption. In a world of 9 billion people, this means 33 - 55 GJ/pp/yr, after we electrify personal transport and massively insulate buildings.